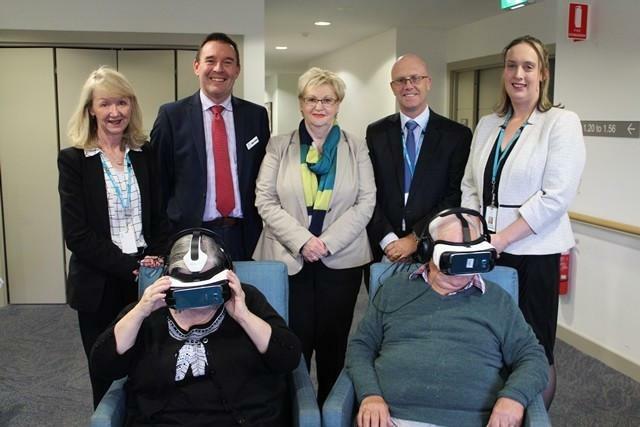 Shadow Assistant Minister for Aged Care Senator Helen Polley's visit to Mercy Place Parkville took her way beyond Victoria's borders when she tried out a pair of the home's virtual reality glasses. The glasses transport the wearer to exotic locations such as Africa or Europe, and as well providing entertainment, they can also stimulate reminiscence and conversations with residents who otherwise might have trouble communicating. Senator Polley says she enjoyed an African safari while trialling the 3D virtual reality goggles and thinks the benefits for those living with dementia is incredible. Mercy Place Parkville bought four virtual reality glasses as part of a pilot project last year, with the aim of engaging discussion around reminiscence and creating conversation triggers that will allow residents to participate more actively within their environment. The Mercy Health virtual reality project has been so successful, it has since been rolled out to Mercy Health’s 22 aged care homes across Australia thanks to funding from Equity Trustees, Campbell Edwards Trust, Mazda Foundation, Jack Brockhoff Foundation, and other private donors. Mercy Health Group Chief Executive Officer Adjunct Professor Stephen Cornelissen welcomed Senator Polley’s visit to the home and says it was nice to be able to showcase just one of the ways Mercy Health is helping residents stay socially connected and engaged. “Our person centred model of care means we are constantly looking at new ways to support, stimulate and empower our residents,” Adjunct Professor Cornelissen says.